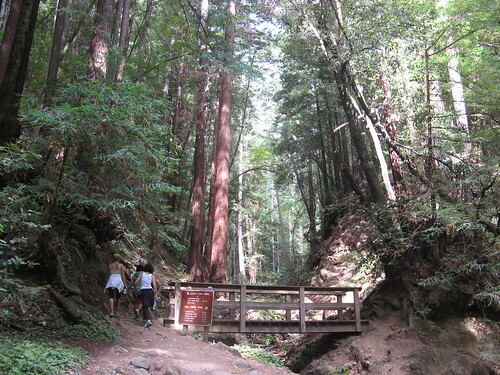 Fall Creek Unit might best be described as the Hiker-Friendly Unit of Henry Cowell Redwoods State Park, which has a few ancient redwoods in its main section, lot of car campers and a popular swimming hole along the San Lorenzo River. The Fall Creek Unit, a few miles north, has no facilities (not even a porta potty, much less a drinking fountain), but it does have some of the region’s best trails through second-growth redwoods, Douglas fir, tan oak and other trees. It’s pretty much all shaded, which guarantees pleasant hiking in the height of summer. Fall Creek is rarely crowded, because most people don’t know it’s there. The parking lot is about a half mile from Highway 9 on Felton Empire Road and you can’t see the sign till you’re right on top of it. Once you get there, though, you’re in for some sublime trekking. Here’s a map I mashed together from one available for a $1 download at Virtual Parks.org. Please buy the real thing, this is just a scaled-down approximation. 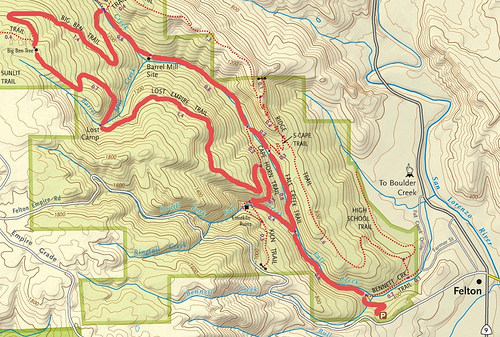 My favorite hike is a fairly strenuous eight miles along the route shown above. It starts out for .2 mile down from the parking lot to the Fall Creek Trail. At the trail junction you bear left, following Fall Creek for .6 mile till you reach a bridge crossing the creek. When you’re done checking out the ruins, continue on the Cape Horn Trail for about a third of a mile to a junction with the Lost Empire Trail. After a left turn here, it’s a steep climb for 1.4 miles to an excellent glade along a creek called Lost Camp: a great place to stop for lunch. From there it’s another .7 mile, again uphill most of the way, to the Big Ben Tree. It’s a massive old-growth redwood, perhaps 800 to a thousand years old (wild guesses on my part but hey, it’s really big). From there you take the Big Ben Trail downhill for 1.4 miles through one of the loveliest parts sections of the park. It’s remote, quiet and shrouded in towering redwoods and Douglas firs. And, thankfully, all downhill. The creek crossing at the bottom of this section is tricky: you might have to wade through during the rainy season, but in late summer it’s usually possible to rock-hop across. Once you’re across you turn right and follow the trail downstream. The riparian corridor along here is simply gorgeous: small waterfalls here and there, bubbling and trickling water, all downhill. Borderline perfect. 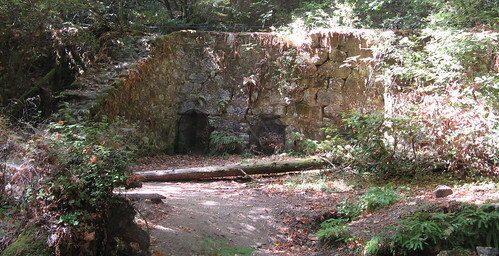 You can stop off at the Barrel Mill site. It’s mostly rusty old junk left over from the industrial era but it does offer a place to rest your feet. Eventually the Fall Creek Trail closes this loop at the original bridge crossing, which means you’re just .8 mile from the parking lot. Cross the bridge and keep following the creek downstream till you see the sign pointing to the parking lot. Note: Make sure you turn right here, not left. From there it’s an easy climb back to where you started from. Redwood Hikes goes much the same way. When I was living in Santa Cruz, Fall Creek was one of my favorite places to go on a first date. I figured if they could handle a hike in the redwoods with me, they could handle just about anything. More than 45 years ago, my Mom and aunt would wake up early in the family cabin on Zayente Road, then dash off to Fall Creek because it was the best trout stream in the area, even better than Zayente Creek. I’m sure it’s changed a lot, but it does me good to hear of it again. They usually got back around noon with 20 nice, pan sized Rainbows. Thanks for the map, Tom. Sweet, Tom! I’ll have to check this out come rainy season! I haven’t been to Cowell in probably two decades – pathetic! This is one of my favorites in the Santa Cruz mountains as well. The creek may not be flowing at a spectacular level but during autumn the big leaf maple are absolutely beautiful! Your giving away all the best kept secrets! No worries, most are home watching the TV, surfing the net, playing with the gameboy, and such.